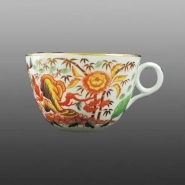 Bone china cup and saucer, printed in red with Chinese-style rock, peony and bamboo pattern. The print is overglaze and after the initial printing the red color was strengthened in places by a dusting of extra color. This process is known as ‘pluck and dust’. The red print has additional painted colors of green, yellow, red, and black, and the design is enhanced with gilding. 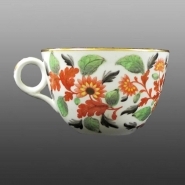 The hand painted enamel mark on the base includes ‘crossed L’s’ above M for Minton, and the pattern number 236.